Are you worried about backing up your photos? Are you worried about losing all of your photos if you lose your phone? 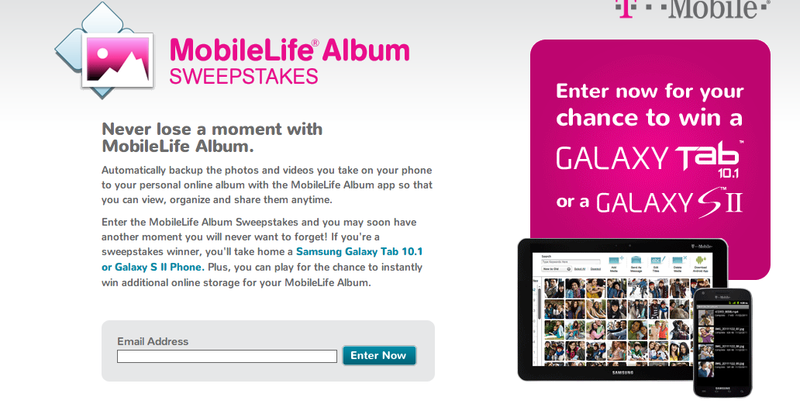 Well, fret not T-Mobile customers as the MobileLife Album sweepstakes hopes to (re)introduce you to T-Mobile’s MobileLife Album platform, not to mention a chance to win a Samsung Galaxy S II or Samsung Galaxy Tab 10.1. T-Mobile’s MobileLife Album will backup your photos and videos to a personal online album with the MobileLife Album app allowing you to view, organize and share them anytime. To receive a sweepstakes entry: To receive a Sweepstakes entry, follow the links and instructions to upload a photo to your MobileLife Album. You can upload a photo through your T-Mobile online account, or you can download the free MobileLife Album app and upload a photo through your mobile phone. Message and data rates apply. After you upload your photo you will receive one (1) Sweepstakes entry. The promotion began March 1st at 12am and runs through April 1st, 2012 at 11:59p.m. ET. To enter just click the http://tmobile.promo.eprize.com/albumsweepstakes url and complete the registration form. What do you have to lose? Certainly not your pictures. The point of it is to annoy you SO much that you post online about it. Don’t care about the app. What’s shocking here is that this is FINALLY a sweepstakes that is NOT done through Twitter. Nice!!! I’ll take a free GS2 or a Tab. I can sell either and buy me that Galaxy Note. Thanks for the Info David. Thanks T-Mobile…got my entry in, but I didn’t win at the game. ANDROID has picasa. nuff said. Hmmmm….since Nokia is shutting down Ovi Share, I may start using this service again…..might as well enter to win too.